We all know that company fixed deposits offer highest interest rates compared to bank fixed deposits. Several investors tempt to invest in company deposits due to higher interest rates. Are these company fixed deposits safe investment options? Earlier, several companies has defaulted the investors in returning back the deposits. Today we would focus on in dept detail about company deposits. 1) High return: Company deposits offer high interest rates ranging 9% to 14% per annum compared to bank fixed deposits which are offering 8% to 9%; hence investors are showing interest towards investing in company deposits. 2) Unsecured deposits: These are unsecured instruments. Unsecured deposits refers that they are not backed up with any security. In case of any unforeseen thing happening with company, these deposit holders would be paid after secured loans are any other preferential payments are made. In case of bank fixed deposits, RBI assures to pay back Rs 1 lakh in case bank is unable to pay back the deposit. There is no assurance from these company deposits. 3) Two categories of deposits: There are two categories of deposits, one is deposits issued by Non Banking Finance Companies (NBFC’s) and another is deposits issued by other companies. a. 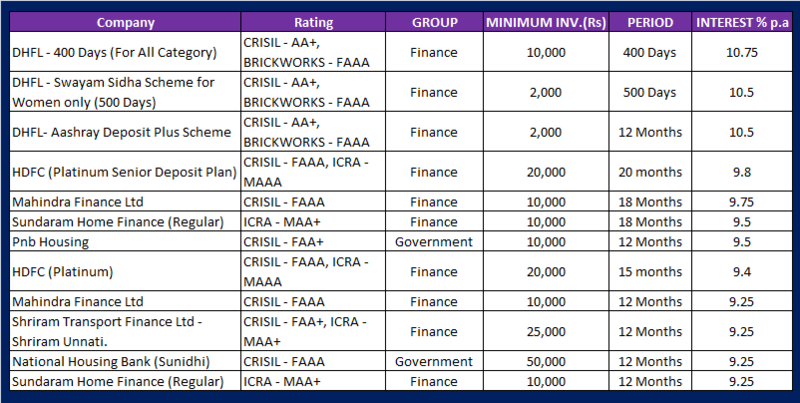 As per guidelines from RBI, company deposits issued by NBFC’s should be rated “AA” and above from any of the rating agencies like Crisil, ICRA and CARE before they go to public for deposits. b. Other companies, there is no need be rated to go to public for raising deposits. However majority of the companies would go for credit rating so that investors would subscribe based on the good rating. 4) Maturity: The maturity of the company deposits is as low as 6 months. However the interest rates would be higher if you invest for 3 to 5 years period. 5) No TDS: There is no tax if interest paid per year is less than Rs 5,000. 1) Interest rates: Invest in company deposits which offer good interest rates. However do not invest in company deposits which are offering 3% over and above bank fixed deposits. Currently bank fixed deposits are offering 8% to 9% interest rates. So, you can invest in any of the company deposits which are offering up to 12% interest rates. Any company offering higher interest rates beyond these are risky. 2) Choose AA and above rated company deposits while you invest: Invest in company deposits which are “AA” and above rated means “High safety”. 3) Invest for short term: Companies performance may change over long term; hence unsecured deposits are not safe for long term. Invest in company deposits for short term period of 1 to 3 years. These are generaly treated as short term investments. 4) Premature withdrawal of deposit may not be possible: You should know that pre-mature withdrawal may not be possible in majority of company deposits like it happens in bank fixed deposits. Do not invest if you need any money for short term or do not invest any emergency fund in company deposits. 5) Diversify in company deposits: If you are planning to invest good amount, invest in company deposits of various companies. E.g. if you are planning to invest Rs 2 lakh, invest Rs 1 lakh each in two different company deposits. 6) Check the performance periodically: You should watch company’s performance periodically and in case of any negative news, try to come out of the company deposit if possible. Conclusion: Investing in company deposits offers highest returns comparing to bank fixed deposits. However you should know that they are unsecured and the risk involved. You should know how to invest and benefit from company deposits. Investing for short term, good AA+ rated deposits and investing the deposits in different companies would diversify your risk and provide maximum returns. Happy investing in company fixed deposits !!! I want to invest Rs.3 lakh in Ansal Prop Properties and Infrastructure as fixed deposit for one year on monthly return basis. Is it safe and secure, please guide me. I have already invested Rs.3.5 lakh in Ansal Properites and Infrastructure for three years on cumulative basis and Rs.1 lakh in Unitech for three years. Also suggest me any other company deposit with good returns.